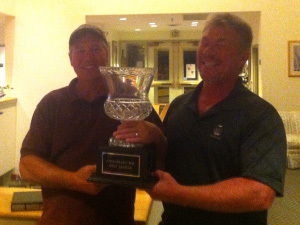 First Place Steve Killon and Tim Taylor won 2+1 over second place Dave Harris and Kevin McLaughlin. Third place Tom Mague and Ron Burcham won 2+1 over fourth place Jeff Medlar and Dave Nickler. Chesapeake Bay Golf Club’s Men’s Twilight League that is Open to the Public competes April-September with Golf every Thursday at both the North East and Rising Sun Courses. The League plays 4 Different Nine’s per month with a shotgun start at 5:30pm each Thursday. The League Format is Match Play every week with 2 Person Teams. Competition began on April 17th at Rising Sun and concluded on September 18th at the North East Course with the top teams competing in Head to Head Competition with a Better Ball of Partners – Net Score.